As the complexity of rich Web applications grows together with the power and number of Web browsers, the next Web engineering challenge to be addressed is to design and deploy Web applications to make coherent use of all devices. As users nowadays operate multiple personal computers, smart phones, tablets, and computing devices embedded into home appliances or cars, the architecture of current Web applications needs to be redesigned to enable what we call Liquid Software. Liquid Web applications not only can take full advantage of the computing, storage and communication resources available on all devices owned by the end user, but also can seamlessly and dynamically migrate from one device to another continuously following the user attention and usage context. 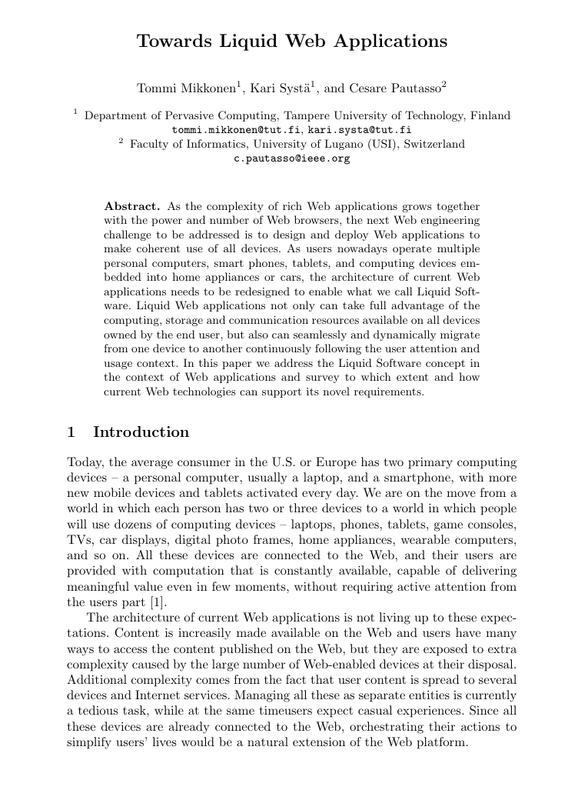 In this paper we address the Liquid Software concept in the context of Web applications and survey to which extent and how current Web technologies can support its novel requirements.